I took the picture above a couple of weeks ago. While I remember seeing this game when I was a little kid, I never actually played it. My guess is it is a lot like The Game of Life. I took this picture because the game depicts not only a black doctor, but also a female mechanic/handywoman. Whoever designed this cover was really going for it out of the box thinking-wise. That got me thinking: How many black doctors do I actually know? I know one personally and one professionally. If we move beyond M.D.s to include PhD's, dentists, etc--I probably know 10-15. I don't know any female mechanics. I do remember seeing a story on tv once about a garage that was staffed completely by women. I think it was in California. So fair readers...how many black medical doctors do you know personally and/or professionally? How about other black people with Doctorates? What about women that fix stuff for a living? Anything noteworthy about your experiences (or lack thereof) to share? Hope you all had a nice 4th of July; leave me a comment if you feel so inclined. Personally? I know zero doctors. Growing up in the poorest county in the entire state in the middle of nowhere caused me to not have even seen a black person until I was somewhere near 7 years old and even then, I was in the big city. While I do know of many fix it girls, none of them are true mechanics. They are just the garden variety back yard mechanic. Again, growing up in the middle of the poorest county in the state is probably the reason for that. A girl needs to know how to hold her own. I probably had one of the best doctors while in the labor and delivery when I was about to deliver my son. He was black and he had such a reassuring personality and seemed to have a great 'gut' instinct and really know his stuff. I lived in 'north county' for a stint and that area is about 80% black population and any time I'd go to the hospital, (doctors offices within the building) I would see more black doctors than white doctors. Plenty of other races too. North County has a small (and dwindling) white population. I have actually hoped that out of all of Abigail's doctors we would sometime end up with at least one black one. And we finally did. Almost immediately Abigail proclaimed, 'she has brown skin like Abigail.' I was glad she noticed. 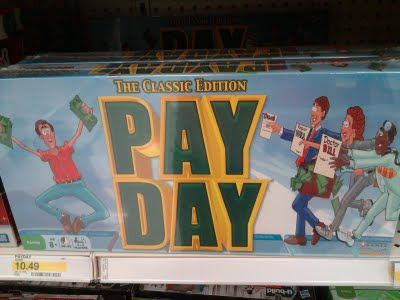 The main character on the payday box is still a white male, that is who the viewer is supposed to identify with. Hmm, I can think of only one black doctor that I have seen that I remember. PhD's . . . maybe one, but I think she has an honorary degree. And I can't think of any female fix-it types. I think you, myblackfriend, need to get a PhD and learn to fix cars. I know about half a dozen black doctors (all but two are my father's colleagues) and no female mechanics. I know two black people with with PhDs and a LOT of black people with JDs (because of my own profession). Go to the DC/Maryland/Virginia area. There are a plethora of Black doctors there. I knew or consulted around 35-40. If you include Ph.D. holders, even more. As for female mechanics... uuuh... good luck with that. just got your comment on my most recent post so thought i'd post back in appreciation :) i do recall you commenting on my blog at one point a while back, which at the time prompted me to check out your profile & blog (which is great btw!). i'm glad you posted a comment on mine today, as it reminded me to read your blog again because i really do enjoy reading it, not only for the writing itself but because it's full of thought-provoking questions that i never can articulate an answer to...which is fun and also frustrating. so basically, as far as this post goes, i don't have much insight, but am reminded of the small-ish town in GA in which i grew up - there was a dr. white who was black, and a dr. black who was white. that's a fun one for the kiddos. thx and i'll be reading more in the future!